Indulge your cravings at the delicious restaurants exclusive to Split Rock Resort. From pizza at the H20 Island Oasis to the delicious breakfast spread at Split Rock Grill! Dining hours of operation are subject to change without notice. Don’t forget to visit our Food Court for coffee, ice cream, pizza, sandwiches and more! Now Featuring our NEW Menu! Dine in for Breakfast and Dinner at this Family Friendly Favorite. 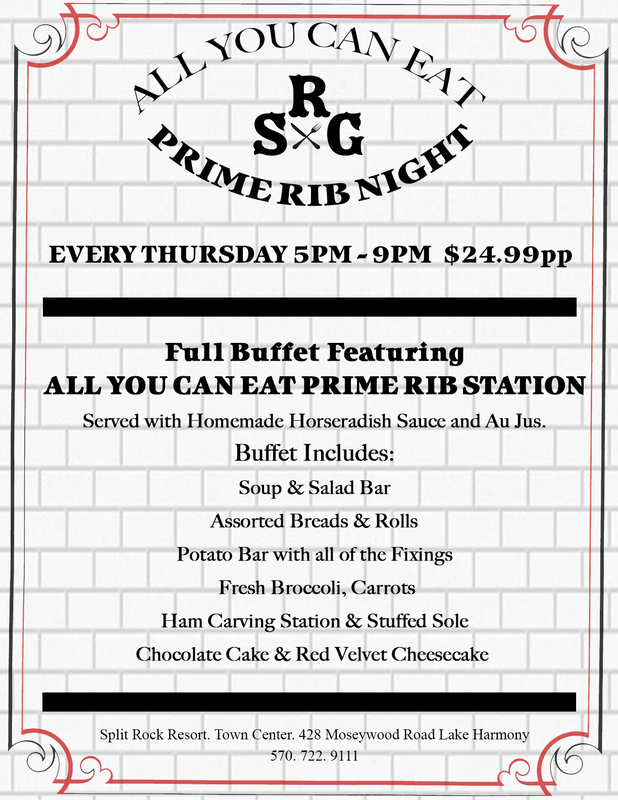 *Thursday Nights ALL YOU CAN EAT Prime Rib! $24.99 includes Full Buffet and Prime Rib Station with homemade Horseradish and Aus Jus! Check out our NEW Rock Bar Menu and Happy Hour Specials as well! Thank you for a great Summer season! We will see you next year! 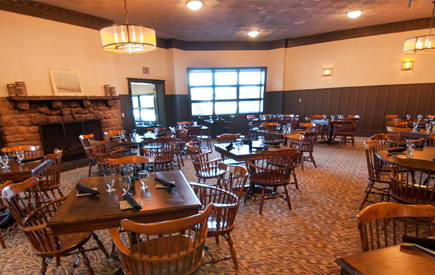 A lovely dining area in the rustic lodge with a beautiful view overlooking Lake Harmony. The perfect place to relax and enjoy a cold drink, good food, and a great view. Closed for the Season! We'll see you next Summer! *Sorry the Moose is CLOSED until further notice* Please stop by and visit the Sandbar or Rock Bar! Enjoy stunning views of Lake Harmony from the Thirsty Moose while sipping a refreshing brew or cocktail. 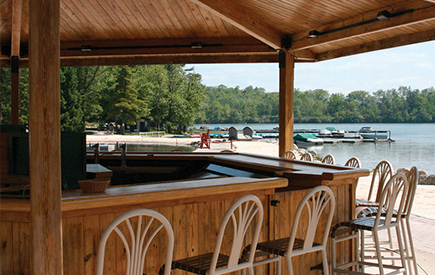 Lake Harmony's Favorite Watering Hole offers live entertainment, drink specials, delicious pub food. Check our our NEW Rock Bar. Menu! Now Serving Lunch Fri-Sun! HAPPY HOUR Sunday-Friday 5pm-7pm with 1/2 Priced Munchies, $6.00 Rum Drinks! PLUS - All day, every day $3.00 Miller Lights! Entertainment Schedule for the Rock Bar & Lounge. 8:00PM - Midnight! When you have a busy day ahead, our food court is a convenient grab and go option with ready to go coffees, sandwiches, salads, and pizza. *Coffee May be purchased in SRG Mon-Fri 8am-11am! Famished after a few too many spins on The Viper slide? We’ve got your hunger covered! Enjoy a savory bite, from pizza and burgers to funnel cake fries. Our cabana themed island bar offers delicious frozen margaritas, piña coladas, and more tasty beverages. Island Oasis is open during water park hours. The Sandbar is still open (weather permitting) Friday - Sunday! CHECK OUT OUR DRINK MENU AND ENTERTAINMENT SCHEDULE HERE FOR SANDBAR AND WHERE NOTED ROCKBAR AS WELL!! Inclement Weather, entertainment will be moved from the SandBar into the Rock Bar in the Town Center! Beach Grill - Closed for the Season! See you next year! Watch Chef Susan Nordt on Chef's Kitchen TV or try Grilled Salmon with Pumpkin Seed Winter Pesto and a Pomegranate Glaze at our Split Rock Grill.